Kauai zipline Tours and Adventures - Kauai Canopy Zip Line tours. The Zip N Dip with Princville Ranch Adventures is a Kauai Zipline Adventure combines the thrill of sailing through the air while getting a bird’s eye view of a Hawaiian jungle paradise. Zip the full Princeville Ranch Adventures zipline course in three hours! This Kauai Zipline Tours course is a combination of nine scenic zip lines and a suspension bridge spanning a waterfall. 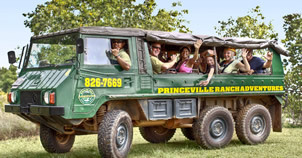 Join Princeville Ranch Adventures for a unique jungle experience on the pristine private lands of Princeville Ranch! The Jungle Valley adventure is not your typical Kauai Zipline Tours. You will experience all sorts of Kauai activities in this action-packed day! Join Outfitters Kauai for Kayaking, Hiking, Ziplines, waterfalls, rope swings, a hayride across Kipu Ranch. Traverse a tropical mountainside on a Kauai Backcountry Adventures Zipline tour. This Kauai Zipline Tour boasts a 7 zipline course! You can “get high” on exhilarating Kauai Zipline Adventures! Clip in and soar like a bird over spectacular scenic views. Walk through the treetops and over waterfalls. This is Kauai ZipLine Tours! Soak in mountain views as you walk off the edge of a lush valley and fly over tree tops. A Kauai Canopy Zip Line Tour is an adventure of a lifetime! Hawaii Zipline Tours have become one of the most popular Hawaii activities. 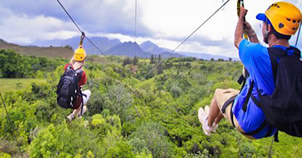 A Kauai zipline tour is an exhilarating way to spend your time in Kauai. 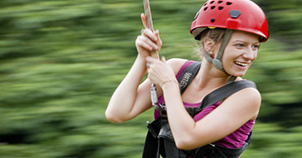 Kauai Zipline Tours offer the best Hawaii Zipline tours at low prices. Choose between Princeville Ranch Adventures, Outfitters Kauai Zipline Tour, and Kauai Backcountry. Each Hawaii Zipline tour is different and we can help you find the Hawaii Tours perfect for you! Reserve your memorable Kauai Canopy Zip Line Tour today! Princeville Ranch Adventures offer 3 Hawaii tours to choose from. The Hawaii activities include Jungle Valley Adventure, Zip n Dip, and Zip Express. Princeville Ranch Adventures offers the Jungle Valley Adventure you will experience several Hawaii activities. Kayak, hike and ride two amazing, 400+ ft zip lines and connecting bridge over a breathtaking twin waterfall and swimming hole. This Hawaii Zipline adventure is four and a half hours. The Princeville Ranch Adventures Zip n Dip Tour combines 8 ziplines, 1 suspension bridge and an hour at the swimming hole. The Zip n Dip Hawaii Tours have a minimum age of 12 years old. The Princeville Ranch Adventures Zip Express is all about zipping. Zip the 8 scenic ziplines and a suspension bridge in three hours. Outfitters Kauai Zipline Tour offers 2 Kauai Zipline tours. Their Hawaii activities include Kipu Falls Trek and Kipu Falls Safari. The Outfitters Kauai Zipline Tour Kipu Falls Trek consists of 4 unique zip lines. Travel from the top to bottom through the forest canopy by zip lines, suspension bridges, elevated walkways and the Zippel line that combines rappelling gear with ziplining. This Outfitters Kauai Zipline Tour course also has a new tandem zipline that allows you to ride side-by-side through the tree tops and over waterfalls. After the Hawaii zipline adventure take a short hike to Kipu Falls for swimming and rope swings. These Hawaii tours are 4.5 hours. The Outfitters Kauai Zipline Tour Kipu Falls Safari includes a variety of Hawaii Activities. Go kayaking, hiking to waterfalls, on a wagon trip across Kipu Ranch, a 275’ zipline adventure, swimming, and a ride on a motorized canoe. These are great activities for kids. Children must be at least 7 years old and fit into the harness to be able to zip the Hawaii Zipline. 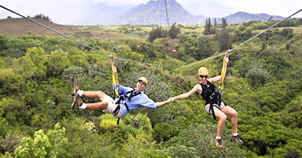 Kauai Backcountry offers 1 Hawaii Zipline tour – the Kauai Backcountry 7 Zipline course tour. Descend the mountain with Kauai Backcounty via seven ziplines. The Kauai Backcountry Tour includes a a delicious picnic lunch in a bamboo grove. After the Kauai Backcountry Kauai Canopy Zip Line Tour, enjoy a refreshing swim. The Kauai Backcountry Hawaii Tours are popular Hawaii Activities. Kauai Backcountry also offers an exciting Kauai Tubing tour. This is a 3 1/2 hour Kauai activity that includes lunch. Both of these activities are great Hawaii activities for Kids. You just need to be 5 year old to enjoy the Tubing, and for some of the zipline tours, and other Hawaii activities there is no age limit. Contact Kauai Zipline Tours or Kauai Zipline Tour for any questions you may have about Hawaii Zipline adventures, Hawaii Tours, Hawaii Activities and Things to do in Hawaii. We have Hawaii Tourist Information that will help you plan and enjoy Hawaii Tours and Hawaii Activities with our parent site, Hawaii Discount. Remember Kauaiziplinetours.com for Hawaii Tourist Information such as Hawaii Sightseeing, Hawaii Tours, Hawaii Activities and especially Hawaii Zipline Tours. If you are interested in Zipline tours on the other Hawaiian Islands, be sure to check out out other Zipline sites which include Big Island zipline tours, which includes videos and online ordering on Big Island Eco Adventures. There are also Maui Zipline Tours with Piiholo Ranch and Kapalua Adventures, which also offers a Maui Zipline Tour. Save on these Hawaii attractions through our network of discounted sites. Aloha, and enjoy your zipline!